What to do with your bokashi pre-compost. You don’t get soil out of your bokashi bucket. Bokashi composting just doesn’t work that way. After two weeks of being sealed in the bokashi bucket, your food waste will be fermented (or pickled). This fermented food waste is often referred to as bokashi pre-compost. This bokashi pre-compost is then mixed with soil where the biota (worms, fungi, bacteria etc) will break it down into fantastic soil to grow your plants. The trench method requires you to dig a hole (or trench) in your garden soil. Add your bokashi pre-compost and then mix well with a couple of shovels of garden soil. Cover with at least 6 inches of soil. Leave for 2 weeks and your fortified soil will be ready for planting. Larger pieces of food waste, such as bones, may take longer than 2 weeks to break down completely. Watch this short video to find out more. Alternatively, you can dig a number of smaller holes and bury your pre-compost in the same way as for the trench method. This method works well if you do not have a large enough area of bare soil to bury all of the bokashi pre-compost together. Or maybe you have lots of different plants and areas of the garden that you want to feed with the bokashi pre-compost. Another popular method, is to bury your pre-compost in your compost pile. The beneficial microbes in the bokashi pre-compost will give your compost pile a boost. 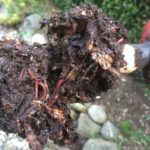 This is a great way to reinvigorate a slow or failing compost pile, particularly during the colder winter months when compost piles often struggle. A bokashi soil factory is becoming an increasingly popular way to handle bokashi pre-compost. This is simply a large container into which you can mix garden soil and bokashi pre-compost. This is an ideal method for people with limited garden space. Similarly, it works really well over the winter, when your soil may be frozen and/or covered in snow. Bokashi pre-compost can be added to a worm composter. However, the bokashi pre-compost is acidic, and worms do not thrive in acidic environments. 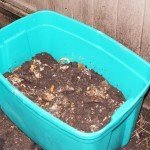 Before adding your bokashi pre-compost to your worm bin, read these tips. Bokashi pre-compost is teeming with beneficial microbes and nutrients. If you don’t have space in your own garden, why not give to a friend or community garden? Maybe your neighbor’s garden is looking a bit tired. Help them bury a bucket of pre-compost and let them experience the great results themselves. Maybe you can exchange it for some homegrown produce later in the season? Finally, if you really can’t find a place for your full bokashi bin then you can simply leave it in your indoor composter until you have space. Maybe you have row of carrots about to finish or some potatoes to be dug up in a week or two. The pre-compost won’t harm from sitting in the kitchen composter for an extra week or two, or longer. Once the fermentation process has finished, the microbes will simply become dormant until they are mixed with soil. Order now! Find all your bokashi composting supplies in our online shop. Very good write-up. I definitely love this website. Keep writing!